The best team building activities (also known as bonding sessions) help build team rapport by encouraging teamwork and collaboration. 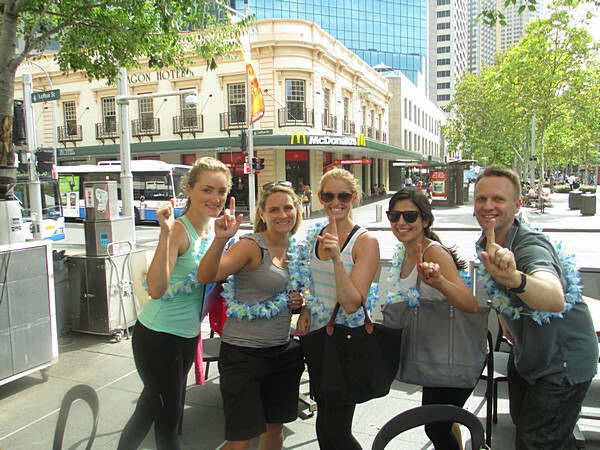 In Sydney, the focus on investing in the right team-building exercises continues to grow. Companies across Australia recognise the importance of retaining the right talent with an aligned, diverse, positive company culture. Fun and interesting team building activities can help co-workers see each other in a different light, They can connect and interact in settings that aren’t work focused and build natural relationships. Choosing the right exercise will build trust and create a workplace environment that’s more productive, efficient and inclusive. One of the most powerful reasons any company engages in team-building exercises is to build cohesion. Through a series of carefully-planned bonding events, your team can build skills for planning, communication, conflict resolution, and problem-solving. Below are some of the most popular team building activities available in Sydney. Before we offer inspiration, why invest time, energy and money in teambuilding and how should you choose the best team building activity for your team? Allowing staff to make friends in the workplace might not seem like a big deal to companies, but it can help to significantly improve productivity and morale. When people can work together better, they also act more decisively to deal with unexpected problems and stay in their roles longer. Team bonding activities can also mean that projects that require collaboration go smoother in the workplace. After building a relationship through team-building activities, employees better understand how to utilise each other’s strengths and weaknesses. Competition has been proven to increase productivity in the workplace. Channelling that competition into a positive format through fun and games can help employees to let off steam and enjoy their careers. Staff members often work better when they feel like they’re part of a team. Hosting team-building activities can help everyone to feel more involved in the workplace, meaning that your employees will work harder, and be more dedicated to their brand. Finally, sometimes all you need for innovation in the workplace, is a chance to get away from your everyday environment and do something new. People have more imagination when they’re outside of the office, and also feel more open to creativity when they’re around people their comfortable with. Teambuilding solutions can break down office barriers and let inspiration pour through. Finally, nothing in the average workplace can get done unless people feel comfortable talking to each other. Team-building activities are essential for facilitating communication and better teamwork. Everyone wants a friendlier working environment, where people are comfortable with their co-workers. Now that you know the benefits of team building activities, it’s time to start looking for exercises that might help to inspire and motivate your employees. Ideally, your aim should be to look for something that gets hearts pumping and brains working in a way that’s different to your standard office experience. The options we’re about to outline below have been proven to be effective in improving productivity, enhancing collaboration, and helping companies to make the most out of their work environment. These solutions are fun and engaging, while also being perfect for building skills that are crucial to the average work environment. An engaging and exciting activity that’s adored by all kinds of teams, this scavenger-hunt-style activity helps to boost creativity in the minds of employees. It’s suitable for teams of all sizes, gets the entire workforce outside, and even introduces a healthy amount of competition too. There are 9 incredible courses throughout Sydney to choose from. If your employees spend most of their time sitting in front of a desk, then it might be a good idea to think about getting them active. Team Bonding’s Mini Olympics is ideal for teams of all sizes, and involves a range of incredible challenges, designed to get people laughing and working together for great results. Laugh a minute is an indoor team building event, often paired with casual meals and other simple solutions for improving communication. Teams in this event compete for game-show style points, leading to a dynamic and exciting experience for everyone. It’s a fast-moving experience that’s sure to get plenty of laughs and smiles. Paparazzi is an engaging ice-breaker solution with low physical exertion. It’s like a photography scavenger hunt around some checkpoints and great locations, and the tasks are creative, requiring your teams to truly collaborate in an effort to win first place. Paparazzi is fun, easy, and a great way to get people interacting in a new format. If you’re looking for team-building session to get you outdoors and enjoying the fresh air our “tasting plate” event Best of Outdoors could be the right option for you. This event is ideal for large groups who want active, engaging team-building exercise without as much physical focus as the Mini Olympics. One of the most popular events in Sydney right now, it’s great for diverse teams who want something for everyone. Sometimes, companies search for team-building exercises that aren’t quite as physically challenging as some of the more common outdoor activities. Kombi Kapers is a unique and enjoyable solution that bridges the gap between scavenger hunts and car rallies. Most of the distance will be covered in a beautiful vintage Kombi. This fantastic activity is perfect for people who don’t want to run around much, but still want to build important memories. Perhaps one of the most traditional and well-known team-building activities around, a murder mystery experience is something that your team is unlikely to forget. There’s no need for acting or dressing up. Instead, with this incredible activity, you’ll simply convince your staff that they’re attending an everyday function, where a talented team of cast members will interrupt proceedings with some top-of-the-range drama. Who hasn’t thought about running away to the circus when times start to get tough? The chances are that your team have already learned how to juggle a range of tasks and skills, so why not give them the opportunity to expand their circus talents even further by really learning to juggle? Our Circus Skills Workshop gives teams the chance to try something fun, and start laughing with team members. No matter how serious your team might be, it’s worth giving them the chance to explore their creative side and enjoy a little inspiration. A hands-on art creation class like Team Bonding’s Artworks event can help to get everyone looking at the world from a different point of view. Most of these solutions include warm-up exercises to get your employees ready to create, as well as a major project of your choosing. You don’t necessarily need to run a restaurant to benefit from the advantages of cooking lessons for your employees. Cooking and baking can teach staff members a variety of skills, like time management, focus, and creativity. You can amaze yourselves by creating a range of five-star dishes, and enjoy the fruits of your labour afterwards too. All the recipes and guidance are provided, so all your team needs to do is be ready to learn. If your team have already done and enjoyed trivia and wants to go “next level” – you need games designed to get their brains working, engage them in a collection of fast-paced team games. This competitive team-building activity (known as Game On) is brimming with different ways to get involved and enjoy some time collaborating as a group. Sometimes, all you need to do to brush off the cobwebs in your workforce, is to start challenging your team again. Team building trivia games and events can be made thrilling with a range of music and comedy solutions, you can even create your own questions to help build knowledge of your brand or business. Last but not least! Everyone loves music! This fantastic team-building activity offers an exhilarating and enriching experience for everyone involved. It’s perfect for building on teamwork, collaboration, listening and harmony within a group. Even without any musical skills, your team might start to create some beautiful sounds together.